Parents out of town. House to myself. Speakers set up. Saturday. Booze. I'm not your typical teenager. Because all that added up to a layer cake for a family friend, not a crazy party. It was a variation of a cake I made for my RA's 21st birthday, the Chocolate Bourbon Cake from Simply Recipes. Only, instead of a bundt cake, I made a layer cake. Two 9 inch bourbon chocolate cake layers with whipped cream with a hint of bourbon in between and all around, and covered in a rich chocolate ganache. I'll be honest, I don't know what it tasted like all together, but from the wonderful thank-you voicemail I receiver on Sunday night from the birthday boy, I can only imagine that it was tasty. Preheat oven to 350ºF. 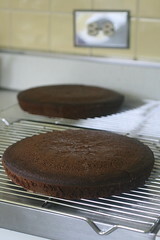 Grease 2 9" round cake pans. For easier removal, grease and line bottom with parchment as well. Place instant coffee in a 2 cup measuring cup and pour boiling water up to the 1 cup line. Stir to dissolve. Stir in bourbon and salt; set aside to cool. In a large bowl or the bowl of a mixer, beat together butter and sugar until light and fluffy and not grainy. Add eggs in one at a time, beating well after each addition. Beat in the vanilla, baking soda, and chocolate. Add 1/3 of the whiskey mixture, followed by 1/2 of the flour mixture. 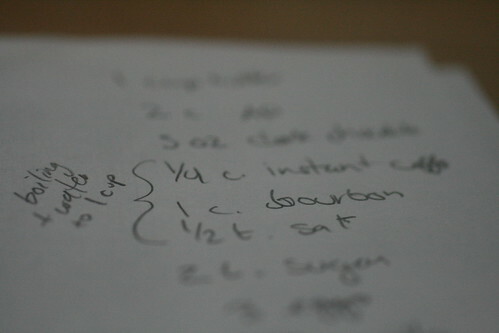 Alternate the whiskey and flour, stirring or beating after each addition, with remaining whiskey and flour. Divide evenly between prepared pans. Bake in oven for about 35 minutes, or until top is dry and a toothpick inserted in center comes out with one or two crumbs attached. Or clean. Let cool in pans 15 minutes. Turn out onto wire rack to cool completely. In a small saucepan, whisk together the sugar, cornstarch, and 1/2 cup of the cream until smooth. Place pan over medium-high heat and bring to a boil, whisking constantly. Allow to boil for about 15 seconds. Remove tthe pan from teh heat and let cool completely. Once it cools, using the whisk attachment of an electric mizer, beat the remaining 2 1/2 cups of heavy cream with the vanilla extract and bourbon at medium-high speed until the cream begins to thicken and the whisk leaves a train in the cream. Add the cooled cream and cornstarch mixture and beat until stiff peaks. Place the chocolate in a small heatproof bowl. In a small saucepan, bring the cream to a gentle boil. Pour the cream over the chocolate and let sit for a minute. With a whisk, whisk the cream and chocolate until smooth. Let sit at room temperature until ready to use. 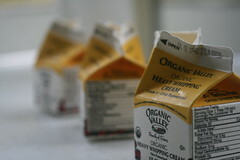 If making far in advance, up to a week, refrigerate and warm to a pourable consistency. 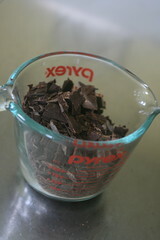 If the ganache is too cold before using it, place bowl over a bowl of simmering water, whisking until slightly warmed. 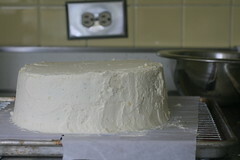 Place to squares of parchment paper on a cake plate with the center crease across the diameter. Place the first cake layer face up on the plate. If overly domed, level the layers first. Cover with about 1 cup of the whipped cream and spread to the sides. Top with other cake layer. Top with another cup of whipped cream and frost the top and sides of the cake. Freeze for about 5 minutes and then frost with remaining whipped cream. Freeze for 15 minutes. 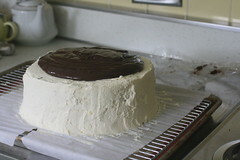 Remove the cake from freezer and pour the chocolate ganache over the cake. 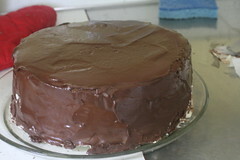 Using an offset spatula, cover the cake with the ganache. Place in the fridge until set, and remove the parchment from under the cake. Keep refrigerated until about 30 minutes before serving.